Scale approximately 1:7,000,000 not "1:3,750,000"
"Compiled from the Originals in the Archives of the U.S.C. & G. Survey Office for Professor A. Agassiz in Cambridge, Washington, D.C. Jan'y 29, 1885." Probably a reduced sized version of the original for inclusion in a government issued report. "Fig [. . . ]" in trimmed upper right margin. 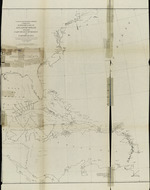 U.S. Coast and Geodetic Survey ; J.E. Hilgard, Supdt. A,-oj5d,'e~ of the. ?X0OxCo ~ fo, of~ ,A.AFO..iOO' i's Ce,, Wo.oo'hfoogton-'.D C.